Research about the role of charity/altruism in poverty reduction has not been much done. This study explores more about the potential and constraints of charity/altruism towards poverty alleviation in the context of social policy. 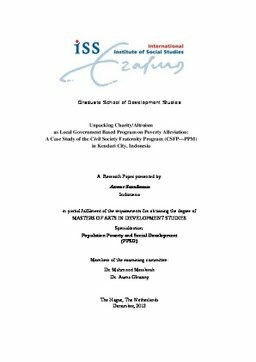 Accordingly, this paper elaborates a unique and interesting local government poverty alleviation program called Civil Society Fraternity Program (CSFP) or Program Persaudaraan Madani (PPM) that has been implemented in Kendari City. The program offers a concept of a symbiotic relationship between the wealthy and the poor within the framework of fraternal relations and solidarity. The basis of this relationship is charity/altruism from the prosperous. The essence of the question to be answered in this paper is to what extent the CSFP---PPM initiated relations mediated by elements of local government and the press enabling to overcome poverty. Data collections from interviews and several forms of documentations (paper, audio and video recorder) were used as the source of quantitative and qualitative analysis. After critical assessing and reflecting the program on a conceptual framework of poor empowerment, some imperative findings and conclusions were resulted. This case study reveals contribution and values of charity/altruism in the social economy and politics context within poverty alleviation effort of a typically local government in Indonesia.